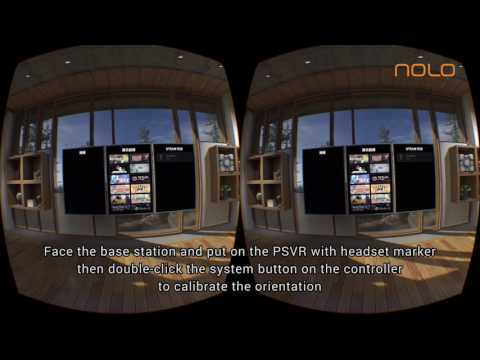 I use NOLO VR with Riftcat to play steamvr it works, but when I use with TrinusPSVR(ver 0.7b)it work incorect direction both headset and controller.mean I move forward but in psvr move backward. Try these steps maybe: ? Thank you "bigelowed" . I have try already and it work for riftcat. It doesn't work for trinuspsvr. @siamk149 Sorry for the late response. We worked with PSVR and fixed the problem lately. Please download the 0.8 version of TrinusPSVR on their website. I'm trying NOLO VR + PSVR now. Apparently it seems that you can not do head tracking at the base station. The steamVR client displays the H icon and the controller icon, but the base station icon is not displayed. The base station would not be shown at SteamVR client. At the moment, Trinus PSVR's compatibility with Nolo has some tracking issues. We have reached out to the Trinus team regarding the issue and will keep you updated with the latest information. A temporary solution for the tracking issue would be set YAW to 180 at the Advance Tab from Trinus PSVR; and do not select 'Use Nolo Orientation'. Thank you for your reply! So we look forward to progress! Hi @MinaF, Would you please check the TrinusPSVR software - it should be updated to the latest version - 0.9.2; and please make sure the YAW has been set to 0 from TrinusPSVR Advanced settings, and do not select 'Use nolo orientation'. Thanks!